The staging of Highland Games in a number of sites throughout North Carolina-home to the largest settlement of Highland Scots outside of Scotland until well into the nineteenth century-has succeeded in creating a renaissance of interest in Scottish history and culture in the state and beyond. The events also serve as favored tourist attractions and colorful reminders of the contributions made by one of North Carolina's most successful immigrant groups. With North Carolina's rich Scottish heritage, there is little wonder that the state is home to several such events, one of which has achieved international stature in its relatively short existence. Modern-day Scottish Highland Games and gatherings are the offshoot of ancient Celtic tests of strength and fitness, as well as competitive activities that later took place at cattle fairs, or "trysts," in Scotland. Some historians credit the eleventh-century king of Scotland, Malcolm Canmore, with the origination of Highland Games. Typical Highland Games as they are known today include various athletic events such as the tossing of weights and the tossing of the caber, as well as competitions in bagpipe playing, Highland dancing, and other festivities. The concept of the "clan gathering" is an American addition to these traditional events, with the atmosphere being somewhat reminiscent of a large family reunion. The first Highland-type games in North Carolina likely occurred at the "Scotch Fairs" held at various sites in the old Highland settlement of the Cape Fear region, notably at Laurel Hill and Ellerbe. Such events were eventually banned by an act of legislature in the 1870s, as it was reported that they had turned into occasions of gambling and drunkenness. It was not until the middle of the twentieth century that interest in Highland Games in their truest sense was revived. The Grandfather Mountain Highland Games, the first and largest in the state, were cofounded in 1956 by the late Agnes MacRae Morton of Linville and Wilmington and Donald F. MacDonald, a native of the Highland settlement of the Cape Fear region who was at the time a reporter with the Charlotte News. MacDonald, inspired by attending the 1954 Braemar Highland Gathering in Scotland, had returned to North Carolina with the idea of recreating a similar event in the state. He had already been instrumental in founding the Robert Burns Society of Charlotte and the Clan Donald Society of the United States, and it was through publicity for these events that Morton learned of his interest in Highland Games. Morton, who had herself been inspired by a relative's report on the Round Hill (Conn.) Highland Gathering, also shared the vision of creating a Highland gathering to be held on the slopes of Grandfather Mountain. Through a mutual friend, the two met and planned the launch of the first Grandfather Mountain Highland Games, which were held on 19 Aug. 1956 to commemorate the 211th anniversary of the first rising of the Jacobite standard at Glenfinnan and the beginning of the 1745 Jacobite Rebellion in Scotland. 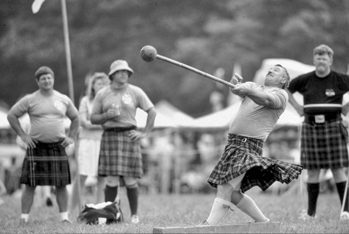 The Grandfather Mountain Highland Games, moved to the second full weekend in July in 1958, have gained international stature, and the standards of competition in athletics, piping and drumming, and dancing are recognized worldwide. Due to the attendance of numerous Scottish clan and family societies, most of which are affiliated with hereditary clan chiefs in Scotland, the Grandfather Mountain Highland Games boasts of being the largest "clan gathering" in the world, with well over 100 such organizations represented each year. The event has grown into a four-day festival that includes a torchlighting opening ceremony, held on the Thursday evening prior to the commencement of the games, and concerts, sing-alongs, dancing, and other musical events in addition to the games themselves. The state's second Highland Games, the Flora MacDonald Highland Games and Gathering of Scottish Clans held in Red Springs, is the only such gathering held in an area recognized for its Scottish settlement. Founded by interested citizens in Red Springs, the first Flora MacDonald Highland Games grew out of the success of a 1976 colonial muster and reenactment of two Revolutionary War skirmishes that involved local Scottish Tories. A full spectrum of competitive events in athletics, piping and drumming, and dancing was added the next year, and the event has become an annual event on the Scottish American calendar, occurring on the first full weekend of October. Fittingly, the event is now held on the campus of the old Flora MacDonald College in Red Springs. Another North Carolina Highland Games was founded in 1979 in Waxhaw, an area settled primarily by Ulster Scots. The idea for these games was conceived in 1978 by interested parties who had been active in Scottish events and who were involved in that year's production of the outdoor drama, Listen and Remember, which documented the coming of Ulster Scots to the Waxhaw region. The Waxhaw Scottish Games are held annually on the last weekend in October and are staged by the Scottish Society of the Waxhaws. The Loch Norman Highland Games, held on the Rural Hill Plantation just north of Charlotte, is the latest outgrowth of the interest created by the Grandfather Mountain Highland Games. By 2004 it was the state's second-largest Highland gathering. Founded in 1992 by numerous members of the Scottish American community in the Charlotte area and deriving its name from nearby Lake Norman, this gathering occurs annually in April and is considered to mark the beginning of the Highland Games season in the South. Emily Ann Donaldson, The Scottish Highland Games in America (1986). R. Celeste Ray, Highland Heritage: Scottish Americans in the American South (2001). Joint Resolution Acknowledging the Contributions of the Scots and Scots-Irish to North Carolina, Session laws and resolutions passed by the General Assembly  (p. 2022): North Carolina Deparment of Cultural Resources Digital Collections. Do you recognize Clan Armstrong there? Would like to come. Clan Armstrong does have a tent at Grandfather, but they don't really show up until the weekend. This year you'll find it in the inner circle around the playing field track. Our son does the Armstrong Clan callout during the opening ceremonies) and are in the tent Thursday night if you'd like to join us for the that. Invictus Maneo!